Children can begin at The Compass as early as their pre-school year and this element of the School’s provision has been highly commended on successive occasions by HM Inspectors and the Care Inspectorate. Enjoying this level of excellence at such a significant point in their early schooling means that, at The Compass, firm foundations are laid for the rapid development of literacy and numeracy from the earliest stage. We offer a comprehensive and wide-ranging curriculum, with French and swimming being taught from age four. There is a strong emphasis on developing sound skills in English language and mathematics with which to access other subjects. 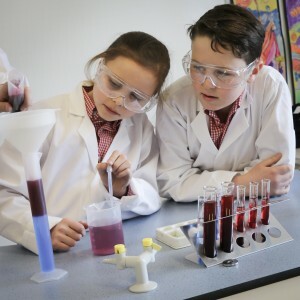 Science, history, geography are taught as specialist subjects from Primary Five upwards. The School has an excellent record in preparing children for entrance assessments into independent secondary schools. Since 2004 when a Primary 7 class was introduced to the School’s provision, all children in the final year have succeeded in gaining places in their chosen secondary school - a proud record reflecting the thorough preparation and support our children enjoy as they approach the next stage of their schooling. In addition, numerous scholarships have been awarded at leading independent schools across Edinburgh and the Lothians. Digital technology is an integral part of our children’s learning experience. 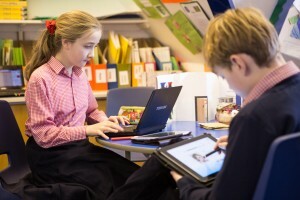 In 2017, The Compass became East Lothian’s first ‘Digital School’ and one of the first in Scotland for its work with digital technology in learning and teaching. The School was also awarded ‘Champion School’ status by iTeach in the same year. Children are assigned their own iPad in Primary 6 and 7, whilst there is one iPad per every two children at all other stages. In addition, interactive televisions and whiteboards and netbooks are used throughout the School, providing children and staff with rich resources for digital learning, communication and presentation. In providing children with further challenges for personal development, we offer a wide-ranging outdoor education programme. During a normal school year, children take part in outward bound courses in Perthshire, Peebleshire and Inverness-shire; hill-walking challenges in the Pentlands and in the Scottish Highlands and expeditions to York and to London. Primary 7 pupils also enjoy an annual expedition to France. Extra-curricular activities too are an important feature of school life with numerous opportunities for children to enjoy after-school clubs and sport. The Compass has built an enviable record of success. Its pupils move on to every type of further schooling. They go to Edinburgh day schools, to preparatory schools as day pupils or boarders and to local authority secondary schools. The children are given every opportunity to develop their abilities to the maximum within a happy, caring and stable environment. This security allows them to develop the confidence and independence required for the new challenges they will encounter at their next school. They make a very positive contribution to the life of their new school and continue to thrive in their educational and personal achievements.